roughly what speeds were you getting before and what are you getting now? It is so hard to get accurate info! Thanks David I will try reconnecting the modem to see it it helps. I just didn't want to show too many disconnections hence my question. I hope someone from PlusNet can come back on here with some more info re this trial and our issues, they have gone very quiet! As I understand it your modem and router will just pick up the new speeds, you shouldn't need to reboot anything. This is NOT what I found. Without me touching anything, my upload speed increased from sub-2Mbps to nearly 16Mbps, but my download speed was still around 38Mbps, the same as it used to be before I requested the upgrade. After several hours like this, I disconnected the Openreach modem from the VDSL faceplate for a minute and then reconnected it. The download speed went up to 56Mbps immediately. It clearly varies, mine just increased overnight, I didn't have to disconnect or reconnect anything. Incidentally, my understanding is that it is a bad idea to pull the cable out of the faceplate to force a disconnection as this can be seen as noise on the line; better to power the modem off. 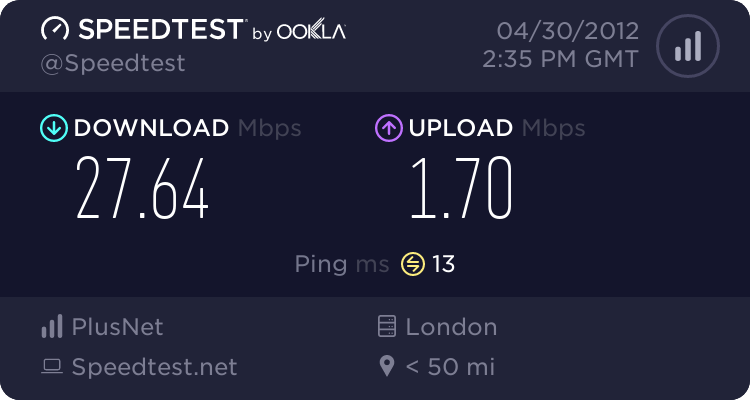 can you do a bt speedtest please http://www.speedtester.bt.com/ , click yes, choose the 'ADSL & Fibre to the caboinet (FTTC) diagnostics' and post your line profile? Also let us know what this https://portal.plus.net/my.html?action=data_transfer_speed reports as your current line speed (it should say 20 Mb). 'Current line speed 37 Mb' is not right for the trial, it should be set to 20 Mb (which is a 'special' test profile). That either means you've not been regreaded to 80/20 or the profile has not been set correctly. I'd call them, make sure you confirm that you are on the 80/20 trial and ask for the 'unrestricted' 20 Mb profile to be set. Looks like this has been done now. Are you seeing the improved speeds? Almost identical figures to me Goldie. There must be some issue here generating these figures. Two weeks in and still no further!